Here at KOZIWARM we have been specialising in the service, repairs and installation of combination and condensing boilers since 1981. We are also one of the largest family run companies in the area and have been covering the whole of North East from Middlesbrough and Durham, Sunderland and Newcastle to Berwick and across to Haltwhistle. Our fully qualified, Gas Safe registered and CRB checked Operatives aim to provide expert professional service at all times. We are also members of several trade and training bodies. Had an issue with my heating and Koziwarm came and fixed it for me. Received excellent service and would recommend them to others. If your old boiler requires replacing or you need a complete new heating system, why not arrange for a free and no obligation quotation. Our experienced assessors will advise you as to the best equipment to meet your needs. All our competitively priced boilers are the most up to date high efficiency models, (according to The Energy Saving Trust, you can save up to 40% on your gas bills with 'A' rated boilers). Once started, our highly skilled installation team will work to the current standards and regulations giving you peace of mind. a SMART Thermostat such as a Tado° or Wave controls. Ask for full details. Removal of cylinder, tank, etc. As we cover such a large area of the North East, all our engineers are strategically placed throughout the area giving you the fastest possible response to your emergency. All emergency response vehicles carry a vast amount of first line spares and up to 90% on various manufacturers, making it possible to get your heating and hot water working as soon as possible. During evenings and weekends we also provide an out of hour service cover, from 5pm to 10pm Monday to Friday, 10am to 10pm Saturday & Sunday and 10am to 10pm Bank Holidays. • Ariston • Ideal • Ferolli • Biasi • Heatline • Halstead • Ravenheat • Viesman and more! All our Gas Safe registered engineers work on LPG and natural gas and are fully trained and qualified to the highest standards. Using the most up to date technology and analysing equipment, we service a vast range of manufacturers appliances including boilers, fires, water heaters and safety checks to cookers and hobs. Also making our service ideal for all Landlords who require a CP12 certificate to comply with Government Regulations. Several service plans are available including our ARMOURPLAN Cover. Annual Boiler Service Package for boilers under The Manufacturer’s Warranty. It is recommended your boiler is serviced once a year by a gas safe registered company. An annual service is a cost effective way of extending the life of your boiler and can help to reduce the running cost and risk of a breakdown. If your boiler is covered by the Manufacturer’s Warranty, it is important that you have the appliance serviced once a year to keep your Warranty valid. KOZIWARM offer a service plan that can cover the life of the Manufacturer’s Warranty Period at a discounted rate giving you total peace of mind that your service’s are booked and paid for in advance. All prices below include VAT. During the boiler service check, we will carry out a full service as per the manufacturer’s recommendation, including checking the boiler for any component faults, the cleaning of any magnetic filter provided the unit has full accessibility. ARMOURPLAN Cover: Due to the very nature of a gas appliance, at some stage you will inevitably have a problem, this can be very inconvenient and in some cases very expensive to repair. We recognise this and can offer our ARMOURPLAN cover to help you during this difficult time. With no worries as to whom you can get to repair the appliance or how much the repair will cost. With one direct call to our office, no middle men, no outside contractors and no fuss, leaving you with total peace of mind for an annual fee. See the benefits for yourself. * Gas Fires, Gas Wall Heater, Cookers/Hobs will all incur an extra charge. residential premises provided for rent by local authorities, housing associations, private sector landlords, housing co-operatives, hostels. The Gas Safety (Installation and Use) Regulations 1998 deals with landlord duties to make sure gas appliances, fittings and flues provided for tenants are safe. 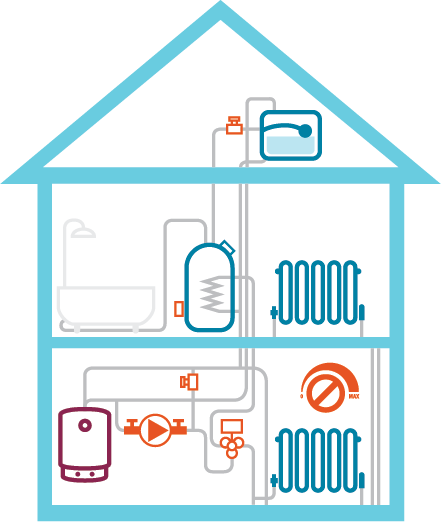 Why not let KOZIWARM take the hassle away and take out a service plan. We will automatically contact you and your tenant when the annual check is due. *Landlords with several properties can qualify for discounts on above cover plans. Any extra appliances installed such as gas fires, gas wall heaters, cookers / hobs will incur an extra charge to the above prices. Over a heating systems lifetime, black iron oxide sludge and lime scale can build-up throughout the system, coating the insides of pipes, radiators, pumps and heat exchangers and reducing the flow of hot water around your heating system. This reduced flow increases the workload on your boiler, which in turn increases your fuel bills. Power flushing is the process of removing this built- up iron oxide and lime scale deposits from a central heating system, using a pressurised mix of water and chemicals. By removing these built-up deposits with a power flush your heating system is restored to its optimum efficiency as hot water can circulate freely throughout your central heating system, reducing the workload on your boiler. At KOZIWARM we help make the process of power flushing as quick and simple as possible, This can usually be carried out in as little as a day on most residential properties. However, larger systems and commercial premises may take longer to power flush. Upon arrival our power flush engineer will survey your central heating system and select the best place to connect the power flush equipment. After connecting the Kamco CF90 power flush machine to your system, a solution of water, chemicals are introduced to the system. This solution helps to break down and loosens the black iron oxide sludge and pushes it through the system, as the solution passes through the system a special Magnaclean magnetic filter captures the iron oxide and removes it from the system allowing only liquid to pass back into the central heating system. Once all iron oxide sludge has been removed from the system the power flush is complete, allowing water to once again freely circulate around the central heating system. We then add a chemical inhibitors to the heating system to help protect your system from future build-ups, a Magnaclean filter and lime-scale inhibitor can also be installed after the power flush to help provide even better protection from further build-up.